When you are well and life smiles at you, you're happy and you feel master of your destiny. Then, suddenly, they diagnose a disease that leaves no way out and falling into a tunnel full of pain and despair. You do not feel prepared to this terrible ordeal for fear that takes your breath, the discomfort, the beginning of a slow death. The cancer and bite from the body as it prepares to die... then comes the light. The tests have revealed me the depth and the true meaning of life. It was two days before Christmas, for me the best day of the year, when I was diagnosed with a dreaded malignancy breast. The world was collapsing on me: suddenly all certainties, joys every perspective of future had dissolved like snow in the sun. Within a few moments, I found myself in the darkest shadows, anguish had taken hold of the mind and stops me all reasoning and thought, and fear fueled despair. I did not know what to hold on, what to do, I was astonished and bewildered, unwittingly tried the brochure of the Invisible Monastery of Charity and Fraternity prayer and began to pray. At the same time I have sought your help dear brothers, who put Jesus to my cry of supplication to find the courage and strength to face what I thought was the ultimate test of my life. Even as a child I always had hospital environment fear, now I had to overcome this fear and at each appointment an anxiety seized me to take my breath. She alternated difficult moments to moments of quiet and I'm sure these were due to the power of prayer; even the people closest to me offered me their help. When I talked to Corrado of my problem, we stayed on the phone for a long time. He passed on peace, serenity and even the joy of being able to offer the Lord this great suffering. That phone call was the beginning of a long series, and thanks to him, even the darkest moments I became bearable. How many times I have I thanked Jesus for putting me next to Corrado, a tangible sign that aid was offering me. Sometimes the fear of having so sorry Jesus to deserve such a great test attacked me ; I spent a lot of time to examine all my past life to find something that could have hurt Jesus. What a fool I was! Jesus loves us so much that sometimes correct us, but I realized later: I understood that I had to abandon myself to His will because only He could be my strength. 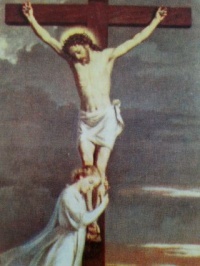 For the surgery here resurface the fears, the doubts and the unknown of what I tried together with the results of the intervention, the anxiety had taken over and I could no longer live because I was scared, but I hope that Jesus would continue to help me, I relived my past life made of fears. The severity of the diagnosis had thrown me into a disturbing apathy and nothing more aroused no interest, all that first made me rejoice now not awakened me any emotion, I could see only darkness in front of me and I felt a feeling of deep anguish that seemed to have limits. The wait unnerved me, and no one could give answers to my requests for clarification. Humanity shouted its weakness and only then I experienced my weakness. The moment of deepest despair a strange force pushed me to turn to God and to implore His aid, and in prayer I found a glimmer of hope and courage to move forward. I realized that the first battle to be won was against my humanity shouting through every pore in his infinite despair and without the help of God I could not make it. They communicated the surgical outcome: the dangerous cancer had not been removed completely and for that you required another surgery… The world collapsed on me a second time. The mind could not understand what was happening: Which affliction! Nothing had taken possession of my soul and I could not see the future, she could no longer contain the human screaming, her fears and suffering. It was a very big and aggressive cancer that within four months had reached five centimeters. And to think that only four months before I was subjected to a check but the tumor had not been found! The doctor who was following me, waiting for the next surgery, he decided to start treatment right away: in view of my age and the size of the tumor, I ordered a very strong treatment. Thus began for me a truly dramatic period. Chemotherapy annihilated me over to take off any physical strength, It was destroying my mind. I was not me! The vacuum was around me, I could not see a way out. What anguish at seeing me so changed! And another fear was replaced in my life, that of no longer being able to love. No longer feel any emotion, no stimulus, it was as if a part of my brain was blocked, but the other knew and saw this change and no one had prepared me, so everything seemed even more terrible. As I cried! Only in Jesus I found the strength to hold on to the hope that everything would be finished sooner or later. The first four chemotherapies were administered to me in three weeks in the hospital away from each other, while other eight would have been able to do in a day hospital. The cure was so long that it seemed interminable. In March I went to the hospital for the first time and the anguish caused me a feeling of nausea: the fear of the unknown made my heart beat so strong that I felt it throbbing neck. I could see around me so much suffering: people with the off and sad look, made by now exhausted by devastating cures that were protracted. My eyes turned toward a wall where I saw the cross of Jesus. He seemed to be talking to me and I wanted to say, "See what I have suffered too." He had suffered for me and I thought I could do something for Jesus: I asked him what I should still face. After seven hours ended my first drip of drugs and fatigue was so strong that I could not stand up. Back at home I thought of dying, I felt a tremendous nausea as never before, sharp pains in the back and joints: I could not stand and fear, with all its consequences, resurfaced. It was the beginning of a long period of suffering because of the drug, besides weakening the physical, struck my mind: I was no longer myself, vacuum reigned in and around me, no emotion stimulated me. I felt like a completely different person from what I was, I had lost the playfulness that was part of my character. The prayer became my only power, to fight my humanity with its fears and weaknesses, and to give effect to my soul. Subsequent admissions showed up with the same problems and at each return home the consequences of the cure were always the worst. After the second chemotherapy, because of an allergic reaction, it appeared on my face a myriad of bubbles: they remained for a long time, even after the medication was stop, that I had procured, and every movement of the face I inflicted more pain. My immune system was very low and I lived in fear of being attacked by a virus, an event that unfortunately happened and I saw myself forced to run to the emergency room for a high fever. On the way to the hospital I prayed for help to Jesus and at the same time I got in touch with Corrado who prayed for me. I was in the emergency room waiting for the result of the analysis. With great joy I learned from the doctor that my values had returned to normal: this meant I could go home, it was not necessary to be admitted. I thanked Jesus, I was sure it was his work to avoid me a further suffering. The fatigue was getting stronger and I realized that my body was dying from the inside. With dismay I began to realize that I did not have sufficient strength to withstand a cure so devastating that the thought that my breath be took away. Nausea would not let me stop and it was so strong, that the stomach seemed destroyed and prevented me to feed, also caused me pain that lasted hours and it did not allow me even to recover his strength with food. One night, after the third therapy, I got up from the bed sweating, exhausted and weak, so that I fell to the ground unconscious. Called the doctor and he told me that I had had an intestinal blockage, caused by anti-nausea medications. I asked Jesus in prayer that come to my rescue and he has never disappointed me. I was informed that the new cycle of chemotherapy would be lighter; do you think that the worst was now behind me and began to make his way up hope. I was wrong, because soon I experienced that because of my state of exhaustion, I was forced to stay in bed most of the day. Six months had passed, now I missed every vital energy and the will to fight. In this prostration I received the news that the second operation had not been definitive. There are no words to describe the immense despair: I should still be made! I sank into a boundless grief, while darkness was enveloping me for a torment that I seemed endless. I had exhausted all the tears, but I still clung with all of myself to the power of prayer, with the certainty that many brothers were helping me in begging Jesus. I do not know where I found the energies without Jesus. So I faced a third surgical intervention with greater hope: I had experienced the immense power of prayer and I could hope to be now come to the end of my slow agony. During hospitalization I had the perception that Jesus was next to me giving me courage. The first few post-operator days were of suffering, but my recovery was so rapid as to astonish doctors they released me from the hospital even with two days in advance. I thought a lot about my past fears and how suffering has changed me: the tests have revealed me the depth and the true meaning of life, and even more I discovered the essence of the love of God, for the way he held me in the darkest hours. I realized that the only important thing in life is love, and what you can give, is what you receive from the people, while the rest can only disturb the serenity of daily life. The most terrible effect of the treatment was its effect on the mind: it has altered the peace, nature and caused me such a sense of nothingness, emptiness and darkness, to make me unable to communicate as dramatic experience. I felt terribly Incomprehension, loneliness and humanly. Suffering has shattered humanity shouting his despair, and I had to endure a tough fight between the affliction and the soul's need, inviting me to trust through prayer to Jesus. It was wonderful the aid received from Jesus, and through my prayers of many brothers: without you, I would surely surrender to the disease. Now that I have met the challenge I feel only joy and a sense of freedom, coupled with the certainty that I will never be alone, because I will always have Jesus in my heart. I wish with all the strength I have in my heart to thank you all brothers of the Invisible Monastery of Charity and Fraternity, because through you the Lord has accepted my prayers. I can now shout all my joy: I feel reborn both physically and in the soul, never forget that you have allowed me, through your prayers, to overcome the longest night of my life. A huge thanks to Corrado who has been the largest and most visible sign of the love of Jesus.